A hotel has been destroyed by a huge fire that continues to burn after more than 24 hours. 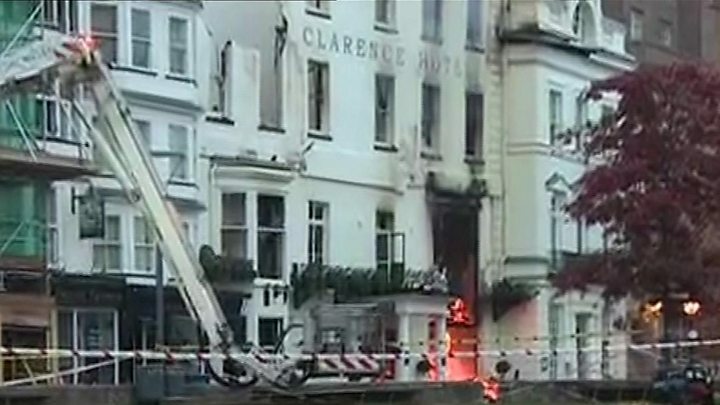 The front of the Royal Clarence, described as England's oldest hotel, has partially fallen away due to the blaze in Exeter, Devon. The fire broke out at about 05:00 BST on Friday in buildings on Cathedral Green before spreading to the hotel, which dates back to 1769. The gas supply was turned off after a ruptured main fuelled the fire. Police believe the fire in the hotel is now largely out. They are bringing in a drone to assess the structure of the building. Structural engineers I have spoken with expect the facade of the hotel to crumble further. The fire did spread into the Laura Ashley store on High Street but that has been contained. Services and a concert at Exeter Cathedral have been cancelled and there is an overwhelming sense of sadness in the city. The fire broke out above the Castle Fine Art gallery where renovation work was under way, before spreading to the Well House Tavern, a cafe and the Royal Clarence Hotel. A spokesman for the fire service said the gallery and hotel had been destroyed by the blaze, but that the cause of the fire was unknown. Fire crews are expected to remain at the scene until Sunday. Chief fire officer Lee Howell said: "We're grateful no one has been hurt in this incident but the community has lost a historic building which is a landmark of the city. "We kept significant resources at the scene to ensure we were able to deal with every eventuality and we will continue to do everything we can to protect the heritage of this city." Media captionFire service: "The fire is still going quite intensely"
Despite the road closures, fire officers, and crowds of onlookers, Nikki and Fraser Burling-Hobbs managed to get married at the Guildhall, just across the road from the partially collapsed Royal Clarence Hotel. 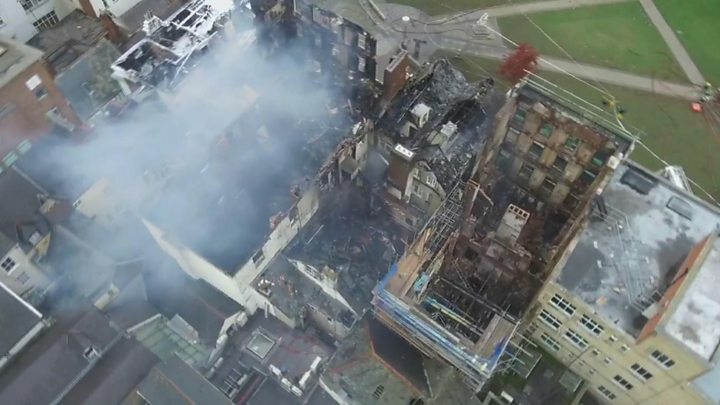 A statement from the hotel owners, Andrew Brownsword Hotels, said: "We are immensely grateful for the tremendous efforts made by all the emergency services and especially the fire service, who have worked with such focus and determination throughout the night. "The support offered by the Mercure Hotel, Exeter City Council and colleagues in Exeter at this difficult time has been overwhelming." The group thanked its own "incredible team of staff" who behaved with "positivity and professionalism" in managing the situation. Guests were evacuated from their rooms in the middle of the night to the nearby Mercure. There were no reported casualties. Lucy, from Australia, told Radio Devon: "I was woken up by the fire alarm at five o'clock. Someone was banging on the door and all I could see were orange flames through the window. "I grabbed my passport there was a lot of fiery ash falling down. The building was totally in flames." Building control engineers told the BBC, the facade of the historic hotel was expected to crumble away. Canon Anna Norman-Walker, from Exeter Cathedral, said: "Moments ago another great crash happened and the front facing is starting to come away. "It's really heartbreaking to see because it's such a magnificent and beautiful building and so much a part of our heritage here in Exeter." Firefighters have been using water from the River Exe hundreds of metres away to help extinguish the blaze. 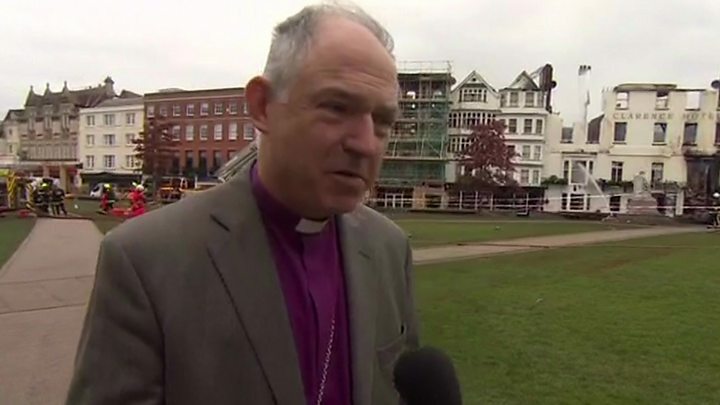 The Bishop of Exeter, Robert Atwell, said: "When people think of bombing during World War Two they only think of London or Coventry, but Exeter was also bombed very heavily. "Lots of our medieval buildings in Exeter were destroyed, but the one that didn't was the wonderful old Royal Clarence Hotel. "To see this ancient building go up in smoke is so sad." The word hotel derives from the Latin "hospes" meaning "guest"
In the Middle Ages, French monks used to provide some shelter for travellers and those houses were called "hospitale"
The hotel was built in 1769, and the landlord in its early days was a Frenchman, Pierre Berlon, who is said to have been the first to apply the word "hotel" to an inn in England.